Why is it that we search for unique destinations, the authentic ones, the hidden gems? Perhaps we are searching for places to escape to, places which give us glimpses into a world minus modern day noise. I have found myself traveling to places which make me feel vulnerable, even a little scared of the unknown. It’s that unpredictably of new surroundings which make us feel alive. Perhaps it’s just that – the feeling of truly living. The un-touched, the authentic and the hidden offer this. Kenya’s Lake Turkana offers this. Lake Turkana is found in the Kenyan Rift Valley, in northern Kenya, with its far northern end crossing into Ethiopia. It is the world’s largest permanent desert lake and the world’s largest alkaline lake. The Omo, Turkwel and Kerio rivers flow into the lake, but lacking outflow, its only water loss is by evaporation. Due to temperature, aridity and geographic inaccessibility, the lake retains its wild character. From Nairobi, we transfer to Wilson Airport, and from there we catch a scheduled flight up north. Our camp lays midway along the western shore of Lake Turkana, which in the local Turkana language means a place of abundant water, indeed it is an area of natural springs whose waters have given rise to a verdant oasis of foliage and distinct animal and birdlife. It is a discreet oasis with a special atmosphere of tranquillity and a halcyon spirit. This stark region was our focus for five nights during a recent private Lake Turkana safari – it is a little-visited part of Kenya and one that offers some incredible photographic opportunities! 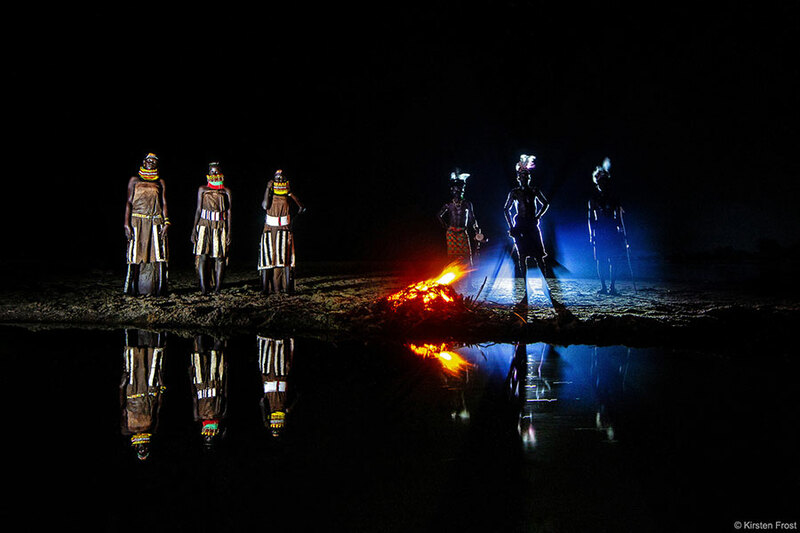 Our Lake Turkana photo tours focus on cultural photography, with our camp being the nexus for journeys around the Lake. 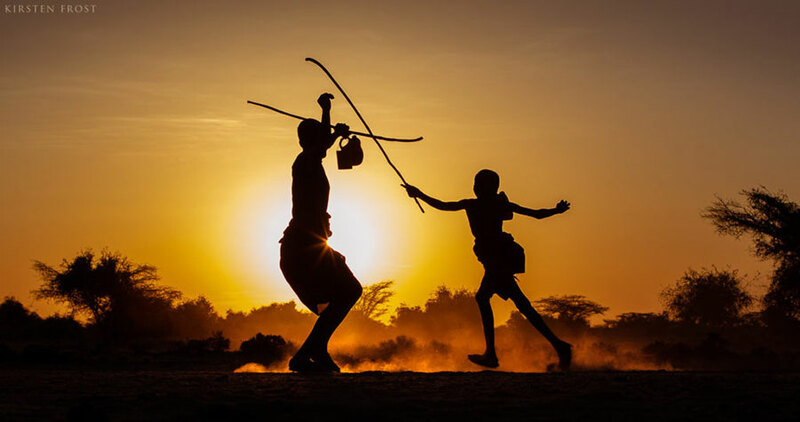 It’s from here that we strike out in an effort to get the best cultural photographic opportunities of the Turkana people. What I enjoy so much about this beautifully harsh region is that it’s so ‘off-the-beaten-track’ that we only ever came across two other tourists during our recent visit. 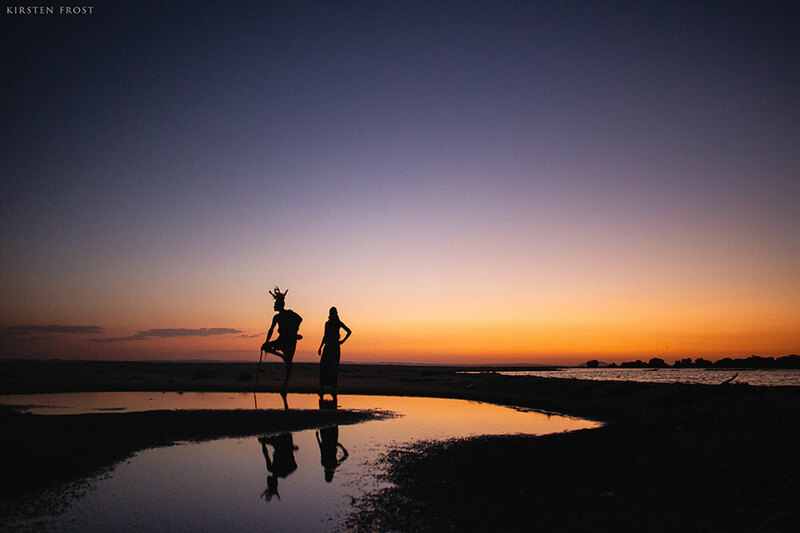 Photographically, the ability to create unique images of people in their environment is what makes this destination very special. Spending time in the sand dunes resulted in wonderful images of men and camels in what seemed like an endless arid landscape. Clouds add drama to these environmental scenes while clear blue sky contrast against the warm skin tones of tall and elegant figures. The lake itself is an amazing backdrop for story-telling environment portraits. 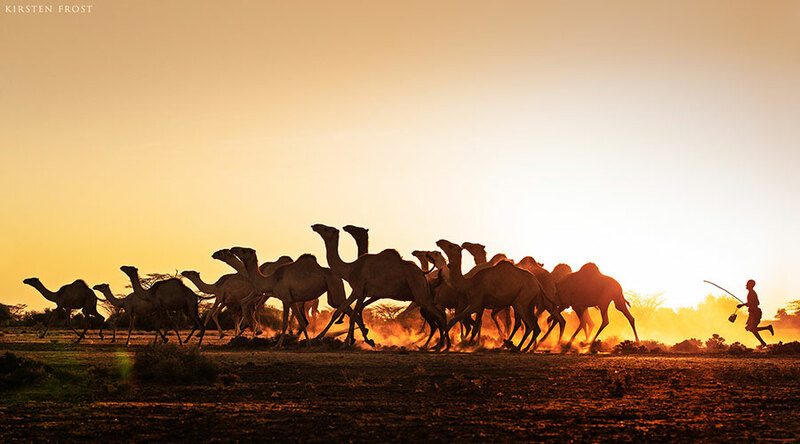 Camels are well adapted to the region’s extreme arid environment. They cope better than cattle and goats during drought periods, which in recent times have severely affected life in northern Kenya. 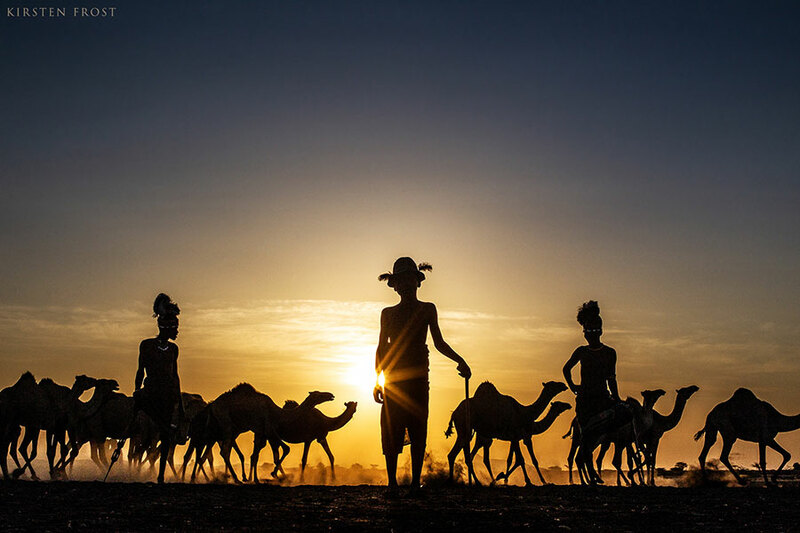 In the scene above, a herdsman directs his camels across a dusty open plain as the sun was setting. Photo tip: when confronted with dusty scenes, photographing into the light has great potential to create moody atmospheric scenes. Along a dusty back road, en-route to our camp situated along Lake Turkana’s shores, we came across these two young boys. They must have been age 11 and 13. Despite their young age, they have a great responsibility. The boys were on a multi-day trek herding their family’s camels many kilometres in search of water and better pastures. Photo tip: As a photo tour leader a goal I set from the get-go is to ensure my guests go home with a diverse portfolio. Warm silhouetted scenes at sunrise or sunset is an effective way of creating images which stand out from the rest and compliment other images within a series. It’s not difficult to create visuals of African countries and its people with an undertone of poverty and destitution. Perhaps it’s the misconceptions people have before they arrive which lead them to inevitably tell a preconceived story through imagery. 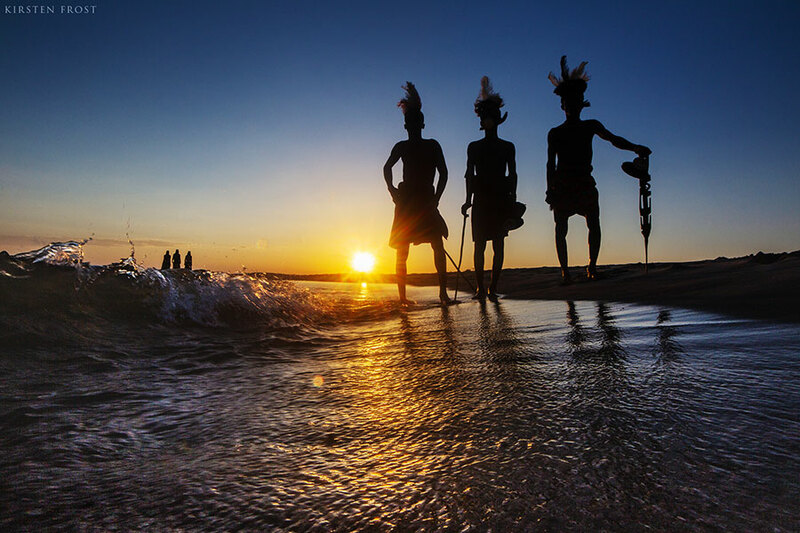 It’s certainly a harsh environment, but to the contrary, it’s one which holds incredible cultural heritage, proud people and amazing hidden landscapes which calls for a celebration. 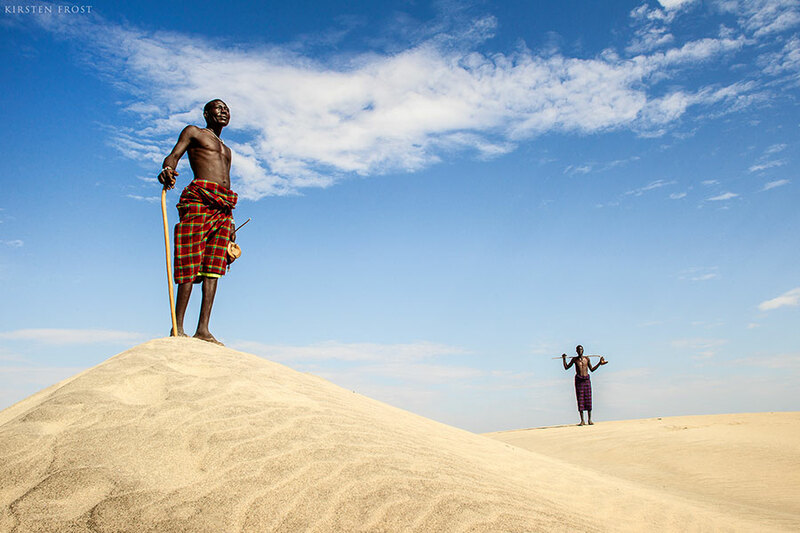 In this scene, a Turkana herdsman stands proud and tall as he gazes towards the Lake in the distance beyond a sea of sand dunes. Photo tip: be open-minded when travelling to remote locations and meeting new people. On your photographic journey be sure to photograph local people with respect and dignity as we document the beauty of life’s diversity. The Turkana people have elaborate clothing and adornment styles. The woman here display vibrantly coloured beaded necklaces and skirts, while the men sport hairstyles made with clay and ocher, called emedot, and are decorated with ostrich feathers to identify them as young warriors as seen in this image. I enjoy exposing my guests to new creative and technical photographic techniques while on photo tours. 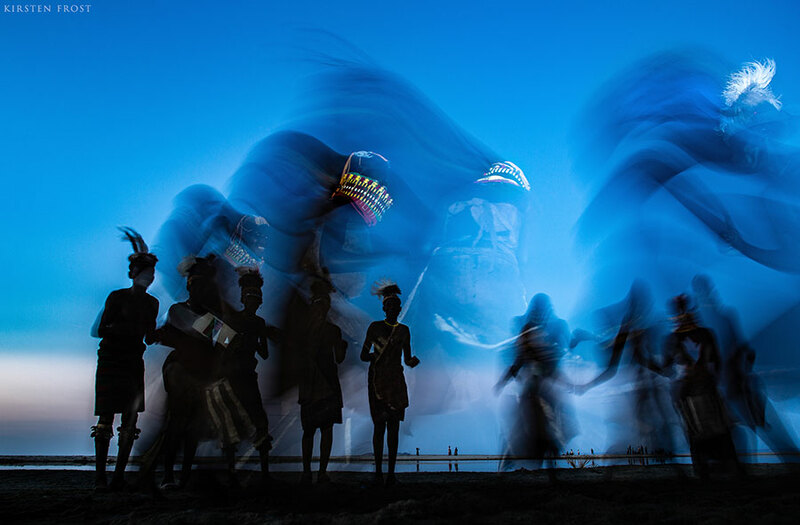 This image is a wonderful example of experimenting with light. In this single exposure, I lit the men on the right from behind using a spotlight and the woman on the left were front lit using a flash. 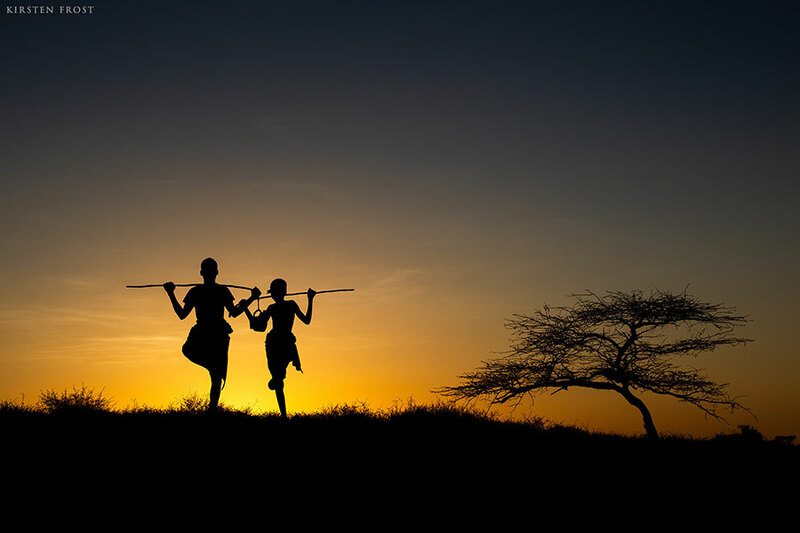 The combination of front and backlighting worked to enhance the images creative flair while emphasising the Turkana peoples mystique nature. The result was an image totally new to the eye. Photo tip: In a world inundated with photos there is a beauty in the unique. Don’t be afraid to experiment with lighting techniques in search of new and exciting photos. 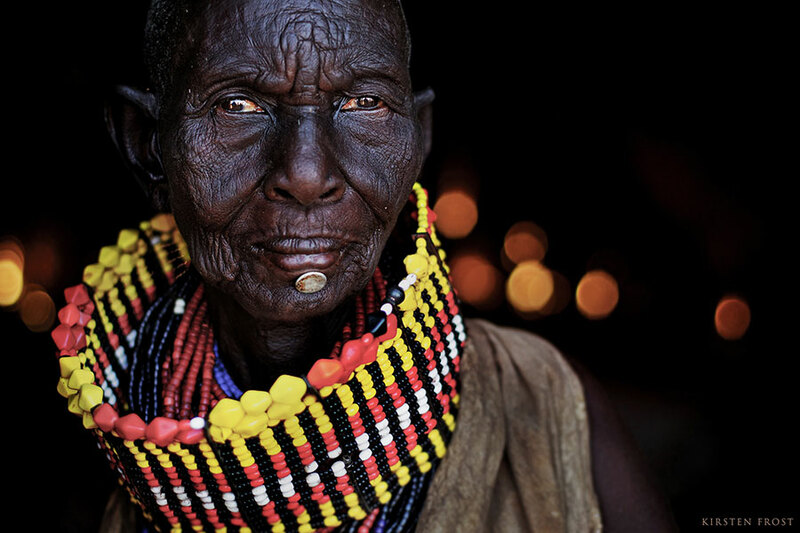 I created this portrait of a Turkana elder as she sat at the entrance of a hut. Huts are constructed over a wooden framework of domed saplings on which fronds of the Doum Palm tree are thatched and lashed on. The orange highlights in the background, which I feel adds so much to this scene, is light piecing between the leaves which cover the hut. Striking is her beaded decor and customary labret pierced through her lower lip. 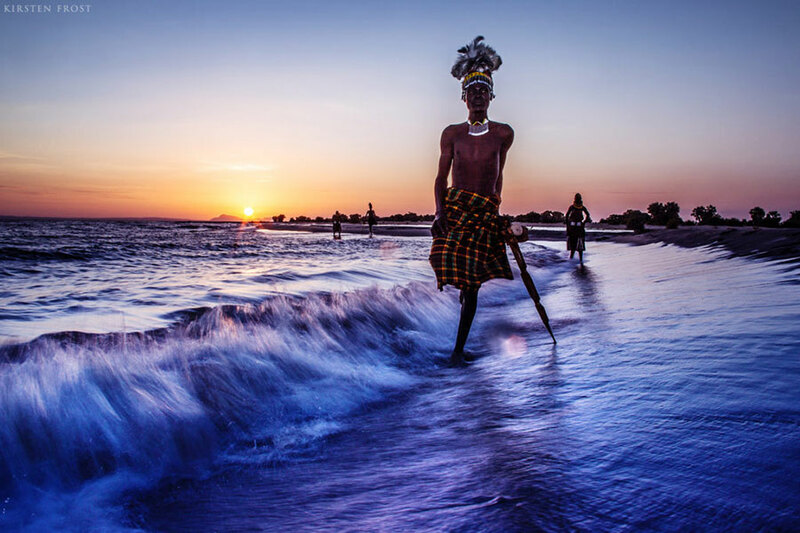 Kenya – Lake Turkana Photo Safari I 2020 – SOLD OUT! If you would like to begin planning your tailor-made journey or join a group departure, send us an email to info@oryxphotography.com. Adventure awaits.